"Black bean sauce, ginger and thai chilies make this zucchini a perfect side dish to go along with any Chinese-style main dish. Add eggplant and snow peas served with a side of fried rice for an exotic weekday meal"
Heat the sesame oil in a wok or large skillet over medium-high heat. Stir fry the onion and garlic in the hot oil until the onion begins to soften, about 2 minutes. Stir in the black bean sauce and chile peppers, and continue stir frying about 30 seconds to coat the onions with the black bean sauce. Stir in the zucchini, ginger, soy sauce, and water. Cover, reduce the heat to medium-low, and cook for 15 minutes until the zucchini is soft, stirring occasionally. 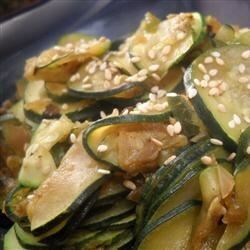 Quick & delicious zucchini stir-fry! I over-cooked a zucchini a tad, but still good! I added a little sesame chicken and it was great!